Discussion in 'Downhill & Freeride' started by dondon, Aug 31, 2005. Anyone have any updates. Seeding runs are tomorrow and DH practise started today. Any websites with updates? How about a betting pool for top Three Elite and Jnr's ? Not in any order yet, ill think about it, but Hill, Peat, Barel, Minnaar should all be up there. Yeah, anyone with any info ? I was just on the official web site for World's and not much happening there ........no pictures of any of the courses, pretty lame. i was talkin to my friend who is there racing and he said the course was getting very rough and beat up, full of bumps and very demanding for the arms, so all is normal for a world championship course. mostly hi speed and some nastiness in the forest. tomorrow morning a few hours of practice till noon, then quali from 2 or 3 pm cant remember. Are we supposed to believe you this time? Ok, Some updates for you. I got into Milan yesterday and met Transcend there. We got a rental car and headed out. I was driving and from what I have read I was a bit nervous about it. Man it was fun. not to many rules here in Italy. At least for driving. Peat was looking FAST! as were both Minnar and Hill. The course has beautiful mountain scenery around the whole place and it is just incredible. Qualifying starts in about 2 hours so we will be out of here soon. but that is the quick and dirty of it so far. .:Jeenyus:. : that's up to you cool guy. has beaten Minnaar and Rennie etc.. already this year, I don't think Rennie has a chance, Kovarik, top 5 yes, top step no! Pascal, Atherton 1+2, Pannozzo, Vasquez, Neethling, Gracia, Justin Leov, Marc BEAUMONT?, Leikhonen, Hannah...............so many names,??? Did I forget to mention Strait for the Junior men....sorry. yea i think kyle definitely has a chance for the top spot of the podium even. hope the mens race turns ot to be as good as it looks on paper with so many in contention for gold. whoa...where was minnaar? is there a weather factor/don't go fast so you can go first type thing going on? Since there are no quali points given at worlds - there are always mad strategies going on in qualifying. Often a team manager likes the idea of his rider sitting on the hot seat for most of the time in front of the woreld press and tv. Also the track is in better condition at the beginning of the day - because of the huge worlds field - more than just top 80 are riding the finals - everyone qualifies. you think that's what minnaar/martin are doing? South African team managers I meet up with friends and fellow filmmakers. two other filmmakers here. So it ended up being only 165 euros to shoot. 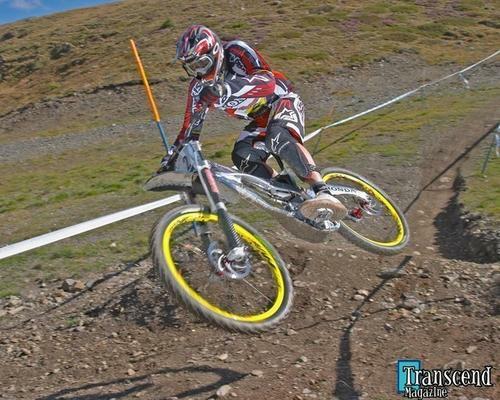 I'm really pulling for Peaty this year. What Dondon said..camelini was stopped in one of the last corners for about 25 mins. Kudos USA elite women, Kathy Pruitt in 6th and the other 2, well the other 2 are DNS...how about that Stikman, these chicks rule hein? Kyle Strait finished 4th fro quailifing, not too bad, but still 5 seconds behind Brendon. If it rains, Sam Hill is going to be World Champ, we all remember Austria, and Italy, both in the rain, and adding up the margin of victories, it was 14 seconds. A lot of people are going the same way as myself in the predictions, Barel was 15 secs down, mind games, weather games, nerves or something simliar to last year. Havukainen DNS??? DDD whats the scealo there. To answer Narlus's question, Ger is riding in the elites. Ben quailified in 47th, lit 20secs back on rail road Hill. Check it out, The World Champ. is going to be televised in the US, too bad I have a crappy dial up connection at home, if not I would pay $4.99 to watch it. I guess I will have to wait for Earthed 3, or Hypnosis.